Nothing beats a BBQ on a warm summer night. It’s a great Aussie tradition, one that is particularly enjoyed with the beautiful weather we are spoilt with here in Perth. Make the most of our outdoors lifestyle by utilising your outdoor space. Bring your outdoor entertaining area to life! A BAC custom outdoor kitchen design can create the outdoor entertaining area you desire. 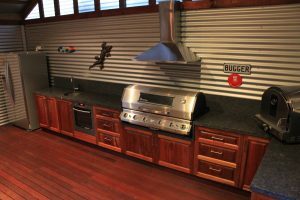 At BAC Custom Cabinets and Kitchens, we focus on your goal and work with to design an outdoor kitchen that you will love to show off to your friends and family. 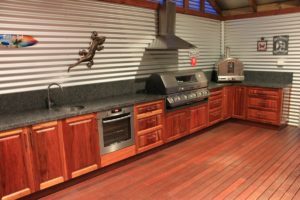 As Perth’s expert outdoor kitchen designers and cabinet makers, we design outdoor kitchens that are custom to your area, your lifestyle and how you would like to utilise the area. Whether you’re after a simple cabinet for your barbecue, or a complete outdoor kitchen design to “wow” and entertain in, we can design your custom solution. We work collaboratively with you throughout the entire design process, maintaining a focus on your end goal. Whether your needs and family life have changed, you have recently moved home or are giving you kitchen that much-need face lift, we can design a unique solution. Every BAC Custom Cabinets and Kitchen project is built with the highest attention to detail and focus on quality, right here in Perth. BAC proudly use Australian and European made materials and hardware, including Blum and Caesarstone. We work with you to ensure you select the right materials for your project, lifestyle and needs. This includes stone, granite, laminate or timber for your bench top surfaces and a wide selection of doors, handles, and closing mechanisms. Our carefully selected, qualified tradesmen complete all work to the highest quality. We ensure effective project management that guarantees all aspects of your custom outdoor kitchen project will be rolled out on an efficient schedule and you’re informed of when your tradesmen will be onsite. Or, if you have a favourite tradie we’re more than happy to work with them too. BAC Custom Cabinets and Kitchens will come to your home to discuss your custom outdoor kitchen design cabinet requirements and provide a free design consultation and written quote. We custom design your outdoor kitchen. Our designer will even create full colour 3D images so you know exactly what your custom cabinets will look like. 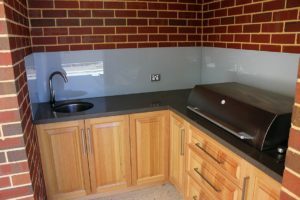 Using only premium supplies, we hand make your custom outdoor kitchen cabinets right here in Perth. We project manage your entire installation, start to finish – including organising the tradesmen or working with your preferred tradesmen.